Memory is a deep purple orchid on the steps of Chennaia��s iconic Connemara Hotel, now known as the Vivanta by Taj. Style is the way that the Connemara has re-created the early morning bed teas, the hearty breakfasts and the delicate institution known as a�?High Teaa�? for the seven days of the Madras Week. 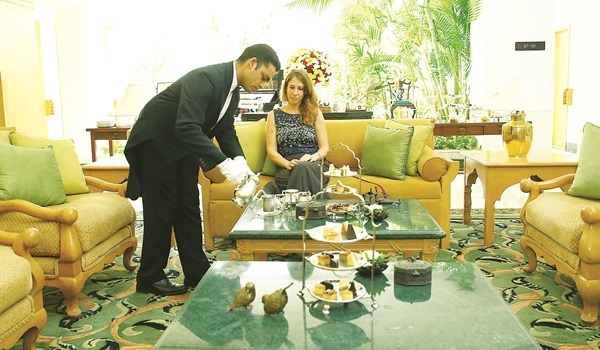 Tall butlers in cut-away coats and black butterfly neckties bend solicitously offering you Darjeeling teas from silver-plated tea pots, with melt-on-the-tongue butter biscuits, toasts and cinnamon rolls. You have, of course, to add the swirling mists of clouds, the butterflies and bugles that were all a part of the plantera��s life in the hills of Assam, or Nilgiris, where the Raj invented the myths that have so often been celebrated in the films and on television. The best part is that you can create your own myths at the Connemara by sampling their Chota Hazri, or mini-breakfast; their Burra Hazri or mega-breakfast (7 am to 10.30 am) or their Lady Connemara High Tea (4 pm to 6.30 pm) that is set in the most charming of locations, within the hotela��s sprawling fern-filled estate. Being insatiable about breakfast, tea and the Raj, I have to confess trying all three institutions under the guidance of GM Ahmar Siddiqui. I felt a bit like Eliza Doolittle being initiated by the mother of Henry Higgins into sipping the liquid gold of an Assam tea from a fine bone China teacup and not being distracted by the number of other goodies that were being sent in my direction. a�?The British in Calcutta set the trend,a�? remarks Siddiqui, a�?they invented the tradition of the Burra Hazri, a really hearty breakfast that included all the best of fish, meats and eggs, with freshly baked bread and preserves.a�? He did not add that after such a meal, the tea planters would get on their horses and do a round of their estates until they got back for a chota peg and lunch on the verandah. As it happens we are sitting at the coffee shop called The Verandah and there is a mist of rain outside. First there is a slice of papaya dotted with tiny scoops of melon balls, followed by porridge that is so like boarding school that we give it a miss. Then cutlets with devil chutney, the real Anglo-Indian version of what later became the American ketchup. We opt for the creamy fish moilee with string hoppers; a robust mutton chops followed by an omelette with a curl of bacon. There are other options here for vegetarians such as scrambled cottage cheese and baked beans. The accompaniments are even better a�� toast, jams, cheese and biscuits. High Tea is of course another matter. The pastry and sandwich makers at the hotel have created bite-sized delights to go with tea and Lady Connemaraa��s ghost. Go now! Ita��s on from August 16-23 for Madras Week.